Need some help figuring this out. 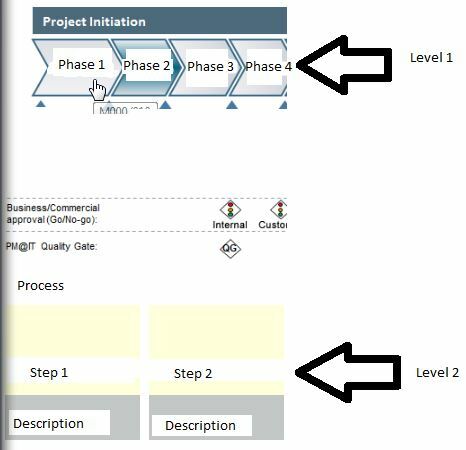 I've replaced the names but the general process is that when the user clicks on Phase 1, I am meant to bring up the steps as tiles below level 1 on the same screen. So level 2 will show the tiles relating to the phase clicked on with the title of what they clicked on( for example 'Process for Phase 1' steps below. This is the design, and I am looking for a solution that will require none / very little coding as it is meant to be easily maintainable by the company.Need help mainly with bringing the tiles under level 1. I've made a choice list column of tiles in my promoted list as 'Filter' for different phases, and want to call a group of tiles relevant to the phase the user clicks on. I don't think there's a no-code or low-code solution for this challenge. Maybe you can achieve something with filter connections: https://support.office.com/en-us/article/connect-a-filter-web-part-to-a-list-view-web-part-on-a-classic-page-4f3f6c10-0a1b-479d-8b4d-c4f1bf49bb3f. Not the answer you're looking for? Browse other questions tagged list html choice-field promoted-links tiles or ask your own question. How to set a multi-choice field value in a sharepoint list using powershell?